I wrote on Wednesday about the greatest non-title NBA teams of all-time, and Matt Zemek offered his take on what made the 1990s Utah Jazz so remarkable. Today, let’s discuss the best NBA players without a ring. Whether we’re talking about Gary Payton, John Stockton and Karl Malone, Reggie Miller or Charles Barkley, the Basketball Hall of Fame is crowded with individuals who failed to hoist the Larry O’Brien Trophy. Let us remember their greatness forever. Patrick Ewing might have been the greatest college basketball player of all-time, and coming out of Georgetown, Ewing appeared to be the most can’t-miss NBA prospect in years. Ewing would have been drafted over Michael Jordan (and Sam Bowie) in the 1984 draft had he come out. 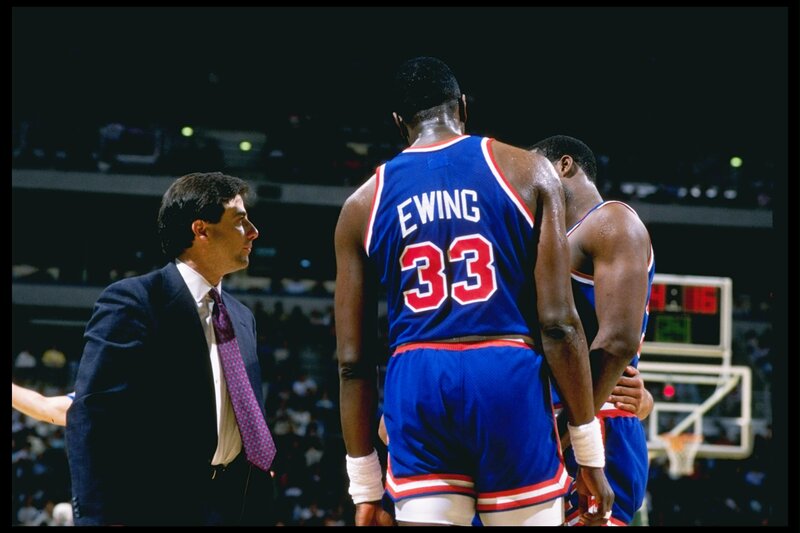 Knowing what we know now about his time in New York, is it unfair to say Ewing’s career feels disappointing? Yet Ewing failed to crack the pantheon of NBA centers during his very good, never great career, and as a result the Knicks only flirted with a title during his prime. He surpassed 25 points per game only twice, and those teams won 45 and 39 games, respectively. He averaged 10.4 rebounds per game with the Knicks, comparatively less than Dave DeBusschere and Elmore Smith. For his prodigious reputation as a shot blocker in college, Ewing never led the NBA in swats, and is 12th in career blocks per game. Ewing never made First Team All-Defense. Not once. There was another level or gear Ewing never reached. He statistically plateaued in his mid-20s and rode that out into his mid-30s — a very good player on very good teams. His averages mostly rolled over from the regular season to his 135 playoff games with New York: the same 20ish points, the same 10 rebounds and the same two blocks. Ewing: 18.9 points, 12.4 rebounds, 1.7 assists, 1.3 steals, 4.3 blocks on 36 percent shooting. Olajuwon: 26.9 points, 9.1 rebounds, 3.6 assists, 1.6 steals, 3.9 blocks on 50 percent shooting. Five years later, the Knicks improbably charged to the NBA Finals and fell to another of Ewing’s big man foes, this time David Robinson and the Spurs. Only the Knicks made it to the Finals without Ewing. Ewing had a sure-fire Hall of Fame career. You just have to wonder if you played his career out 100 times — including redetermining the 1985 lottery and/or letting Ewing instead enter the 1984 draft — would Ewing still come up empty on championships? 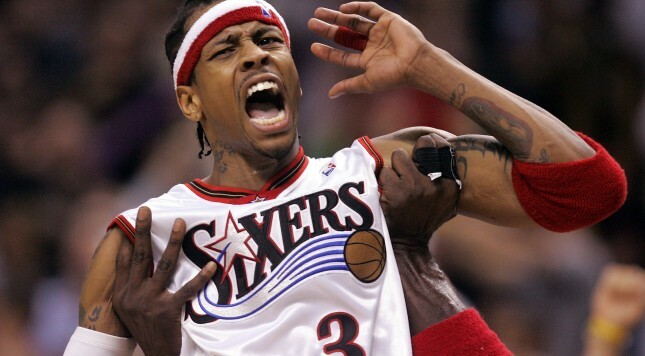 I wrote a lot about Iverson when Matt and I ranked our greatest shooting guards ever. I’ll just leave the most memorable moment of the 2001 NBA Finals here for safe keeping. You know when you steal the show in a blowout Finals loss — and earn the respect of generations for being a ‘true warrior’ — you’ve accomplished something. This crossover was the equivalent of Jerry West’s 1969 NBA Finals MVP. While doing research for a column I wrote last year on Chris Paul and MVP voting, I discovered that Elgin Baylor received the 23rd-most shares of the MVP award over his 14-year career. Of course, the majority of the players ahead of him, and many behind him, actually won the award. Only Jerry West came as close to winning the MVP without coming away with one. Baylor finished Top 5 in MVP voting seven different times, and finished Top 3 four times. He averaged 27.4 points, 13.5 rebounds and 4.3 assists for his career. He peaked in the early ’60s with back-to-back-to-back scoring averages of 34.8, 38.3 and 34.0. He and West were teammates on some of the best teams of the early NBA, but they had the misfortune of competing against Bill Russell’s Celtics one too many times. For more on Baylor’s tortured years against the Celtics, read Matt Zemek on the history of the small forward position. When Baylor retired nine games into his final season, vowing he wouldn’t shatter his legacy by riding the bench to a title, West and his Lakers teammates honored his name by ripping off a record 33-game winning streak and claiming the title that completed West’s resume. When I left Baylor off my greatest small forwards list earlier this month, it wasn’t an easy choice. While he played in a smaller league with less objective talent, Baylor was a beast, and one of the greatest offensive players in league history. Maintaining his pride in ’72 cost him a championship in theory, but Baylor proved he was a champion all those years earlier in his battles against Russell and Wilt Chamberlain. The power forward position is loaded, and the modern era has only exasperated the task of keeping all of these great players straight. It looks bad that I didn’t select Karl Malone, the second leading scorer in NBA history, on my five greatest 4s ever. Like, really bad. What am I supposed to do, though? Kick off Dirk Nowitzki or Kevin Garnett, two players who transformed the way offense and defense, respectively, is played in the NBA? Tim Duncan is fixed at the top of my and everyone else’s list. I guess you want me to give Moses Malone the boot because “he’s not a real power forward.” Well, sorry not sorry, but Moses was making my Top 5 regardless; he’s clearly the best “Malone” in basketball history. That left Karl and Chuck to duke it out for my last spot. It seemed right: Both Dream Teamers. Both lost in the Finals to Jordan but stole MVP awards from him. Both were elite scorers and rebounders with two of the great “basketball bodies” we’ve ever seen (Malone for his perfect conditioning; Barkley for unapologetically rocking the anti-perfect body). 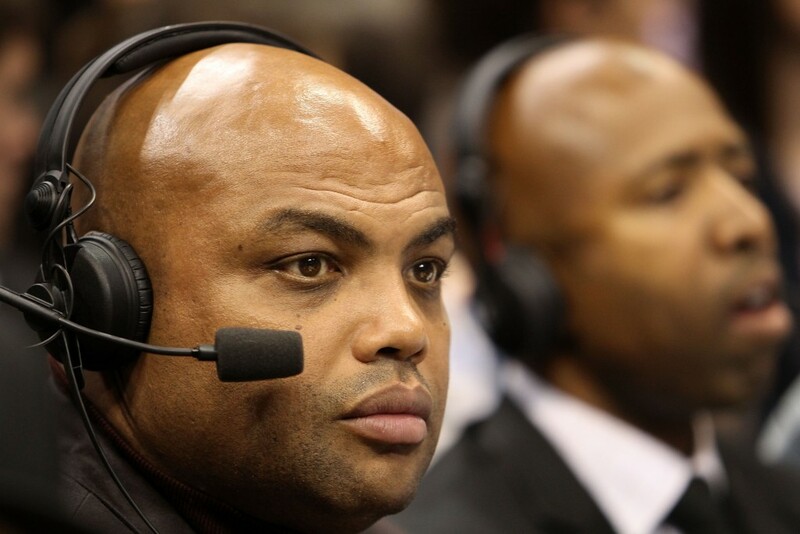 Malone and Barkley are both equipped with two of the monster basketball nicknames ever: The Round Mound of Rebound and The Mailman. WHAT??!!! Can I name my kids after them? So what sets it apart for me? What lands Barkley ahead of Malone? Fair or not, it’s solidarity. Malone had the perfect foundation around him his entire career (sans his failed Lakers season). In Jerry Sloan and John Stockton, Malone couldn’t have handpicked a better system and facilitator to run with. Meanwhile, Barkley began his career on a 76ers team fading away, only two years removed from one of the greatest title teams ever. What makes Malone amazing is his longevity. He averaged 25.4 points, 10.2 rebounds and 3.5 assists over 18 seasons with Utah. He averaged 25 points at age 36, a dozen years apart from his first All-Star season. He won a pair of MVPs, deservingly or not, at age 33 and 35. Barkley’s career, on the other hand, was defined by sheer will. Considering his size, Barkley should never have been the rebounder he was, and yet he led the NBA with 14.6 boards in ’87. His averages during his eight seasons in Philly are ridiculous: 23.3 points, 11.6 rebounds and 3.7 assists. Barkley made 61.4 percent of his 2s with the 76ers, and averaged 4.4 offensive rebound per game; he was an animal. 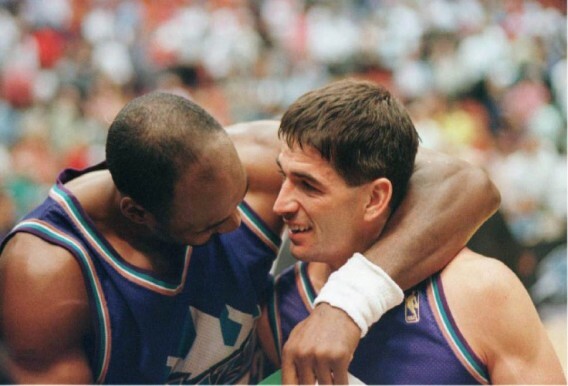 When his marriage with the 76ers ended, he moved to Phoenix, instantly elevating the Suns by nine wins and lifting them to the 1993 NBA Finals. His line over four years with the Suns (23.4 points, 11.5 rebounds and 4.4 assists) was as massive as his behind. When he aged out of being “the man” for the Suns, he joined Olajuwon in Houston, and Barkley pulled down 13.5 rebounds and scored 19.2 points per game for the Rockets. Yes, that ’97 Rockets team lost to the Jazz in the West Finals. Thank you for paying attention! However, Houston won nine games better (sound familiar?) than the year before by adding Barkley, becoming a Finals contender overnight after getting swept in the second round the year before. Both great players. Equals in many ways. I’ll take Barkley.